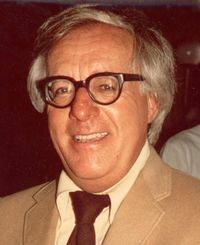 My first encounter with Ray Bradbury happened before I had read any of his stories. I remember I was seated in the auditorium at my grammar school. They showed us a 16mm film of a man with thick glasses wearing a sweater who talked about what it was like being a professional writer. I still remember his kindly smile as he told us that he didn't sell a story the first year that he wrote, or the year after that. He explained that it wasn't until the third year that he made his first sale. He also rode a bicycle, just like I did! He didn't drive a car. He chose not to. I learned two important things from Mr. Bradbury before I read a single word he had written; I learned not to give up, and I learned it was all right to be eccentric. Later on, in high school, I discovered that Mr. Bradbury was the only sci-fi/fantasy writer who was in my English text book. There are others now I am sure, but he paved the way. This is as it should be. Of the writers of his era he wrote short stories that compared favorably to O Henry or Ambrose Bierce. Now he has left us. I hope there are dragons where he has gone. Of course there are, when you live on the edge of Terra Incognito and then cross over.....here there be dragons!